For ergonimically good and well-balanced sleep it takes more than just good single-components. In the end every bed is not really better than its worst part. That is the reason why Stendebach sees the bed as a whole and thinks in sleeping solutions. And even if we would wish for it, not every two single elements harmonize with each other. 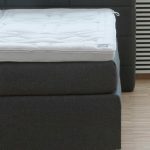 An air sprung mattress has completely other demands to the sprung base than a waterbed, multi-layered boxspring-beds are hard to compare with a combination of slatted frame and cold-foam-mattress. Every system has its very own excellences and disadvantages, which may fit perfectly for one person but don’t provide the needed support for another. The highest degree of flexibility can be found in our air sprung mattress system Cairona®. For everyone looking for a comfortable alternative to standard mattress solutions – air sprung sleep feels like flying! The air-core in this modular design mattress-system allows an exact adaption to personal requirements. An ergonomically righ sleeping position with almost no pressure points becomes the new standard. And thereby is easy to use, maintenance-free and a good choice for allergic sufferers.